The water heater of the future…and the future is now! Home ownership today is all about sustainable maintence. Installing a product that will save you money and is envionrmnetally friendly is an obvious choice for most consumers. The Eternal hybrid tankless water heater offers you both of those advantages for your water heater needs. Combining higher efficiency with lower energy use makes the Eternal hybrid water heater a product that Baker Elman loves to see customers interested in. Using different technology than a traditional water heater allows the Eternal hybrid tankless water heater to function efficiently and avoid the “cold water sandwich” that other tankless water heaters can cause. In Eternal’s Counter Flow design, cold water enters from the bottom up as a way of self cleaning the sedimentation, while heat is pushed through 44 radiating transfer pipes. The Eternal Condensing Hybrid’s innovative 3 cycle process pushes heat in 3 directions through the water and maximizes energy transfer. In simplest terms, our patent slows the exhaust of heat by reusing the energy multiple times, rather than reducing water pressure. The end result is a small heat exchanger that is capable of replacing multiple tanks, while supplying endless hot water with consistent water pressure and doing it efficiently time after time. 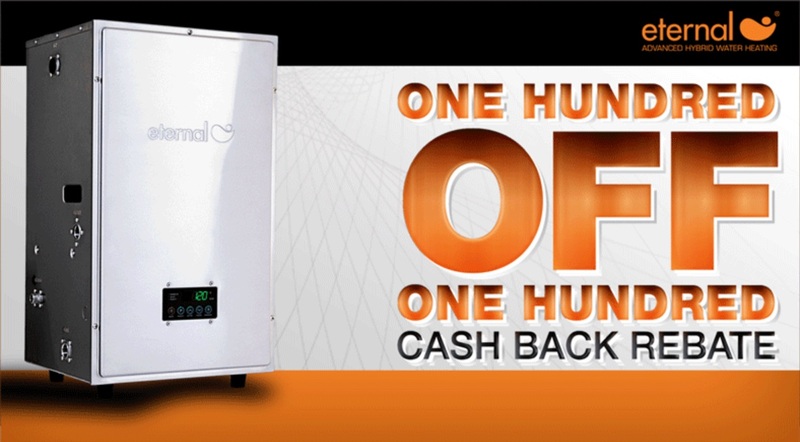 From October 1st 2012 until December 31st, 2012 Eternal is offering a $100.00 cash rebate on their GU100 model. With the Eternal water heater there is no more cold shower for the last one up in the morning. Call Baker Elman today to set up an appointment to evaluate your home for an Eternal water heater. We’d love to help you save money and energy in your home!